To impact the lives of children... that's why football superstar Cam Heyward launched The Heyward House. And that's why I teamed up with Edgar Snyder & Associates, a law firm that gives so much to help kids in our community. We're joining Cam at UPMC Children's Hospital of Pittsburgh to support research at Children's Child Advocacy Center. Together, we're helping to provide clothing, school supplies, and transportation for families in need. When you're fortunate, you give back – that's Pittsburgh defensive lineman Cam Heyward's philosophy. His foundation, The Heyward House, has a clear mission: to help kids who need it most. As a law firm long devoted to giving back to the community, it’s been an honor to team up with Cam throughout the years. 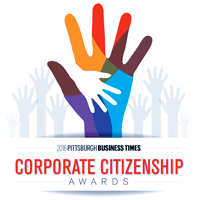 We were honored to feature Cam, his foundation, and their work when we received a Corporate Citizenship Award from the Pittsburgh Business Times. It gave us the chance to talk about the projects we’ve been fortunate enough to be a part of – keep reading to learn more about them below. Together with The Heyward House, we’re now working to support the Child Advocacy Center at UPMC Children’s Hospital of Pittsburgh. The Advocacy Center provides evaluations and assistance for children and adolescents who may be victims of abuse or neglect. We’re helping to contribute clothing, school supplies, and transportation for families in need. We were humbled to recently spend time in Austin’s Playroom at Children’s Hospital with Cam, meeting children and families and hearing their stories. Nothing brings the staff at our law firm a bigger sense of satisfaction than when we are able to help improve children’s lives. KidsVoice advocates for children in the child-welfare system. Some of these kids live in group homes or in foster homes. Some have been abused and neglected. We’ve teamed up with both KidsVoice and The Heyward House to help provide those children with experiences that will leave them with lasting, special memories. Children from KidsVoice have been Cam's guests at training camp and have gone on shoe and winter clothing shopping sprees with him. They are also VIPs at his annual birthday celebration at Dave & Busters – which is really a party for the kids. They are treated to gifts, cake, great food, and most importantly, one-on-one time with some of their favorite athletes. The statistics are alarming: One in five children in the United States faces food insecurity. Three in five teachers say they have children in their classes who regularly come to school hungry. For some children, the meals they're provided at school are the only ones they receive all day. As a result, thousands of children spend their weekends—65 long hours—unsure of when to expect their next meal. Blessings in a Backpack wants to ensure that no child goes hungry, and our firm has teamed up with Cam and his foundation to help make that happen. The program provides food for children in need to take home over the weekend so they have something nutritious to eat. We encourage you to join our team and help fulfill The Heyward House’s mission. You can visit the The Heyward House and the Children’s Hospital of Pittsburgh Foundation websites to donate, volunteer, or find out other ways to get involved.